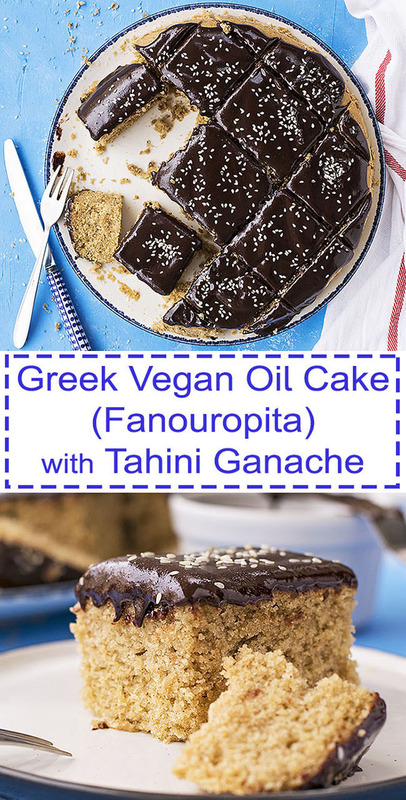 This easy vegan olive oil cake (Fanouropita) is one of the most tender and moist cakes ever! 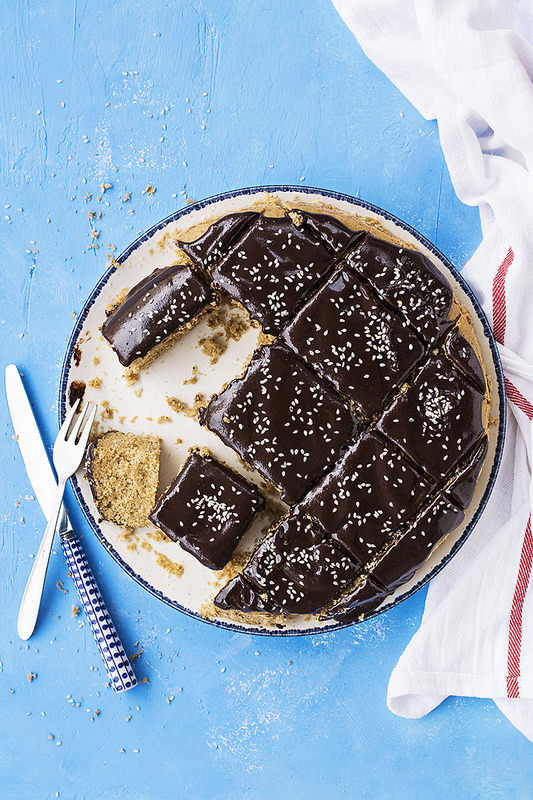 The chocolate-tahini ganache takes it over the top! Making a delicious, tender and moist cake from scratch doesn’t have to be difficult and frustrating. It should be easy and fun! 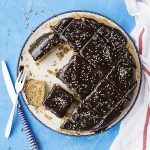 So why not make this traditional vegan Greek cake known as Fanouropita? This Fanouropita is one of the most tender, fluffy, flavorful, and moist cakes ever! I can’t say for sure that it’s the lack of eggs, the orange juice (freshly squeezed if possible! ), the olive oil, or the combination of all the above but this cake manages to stay soft and very moist for a lot of days! You could say this is a Greek sheet cake. Contrary to most American sheet cakes which are rectangular, most Greek one layer cakes are round, probably because round pans are more popular. But ultimately, the shape of this cake really doesn’t matter because it’s so easy to make, it almost feels like cheating. In fact, you’ll only need a bowl and a whisk! Fanouropita doesn’t mean olive oil cake in Greek. It comes from the words Fanourios and pita (=cake) and it means a vegan oil cake that is made in the name of Saint Fanourios, a Saint who helps you find lost or misplaced things. According to the Greek tradition fanouropita is usually made by women when they want to find who their future husband will be, while in other cases it’s made every time someone wants to find something lost (though you’ll agree with me when I say that there are certain things that when lost, even St. Fanourios can’t bring back to us!). As I said, the ingredients should be 7 or 9 but you’ll probably notice that I’ve used more than that. If you want to go according to tradition omit the vanilla extract, the salt, the sesame seeds, and the ganache! However, this cake is so delicious and easy that you should not wait to lose something in order to make it! 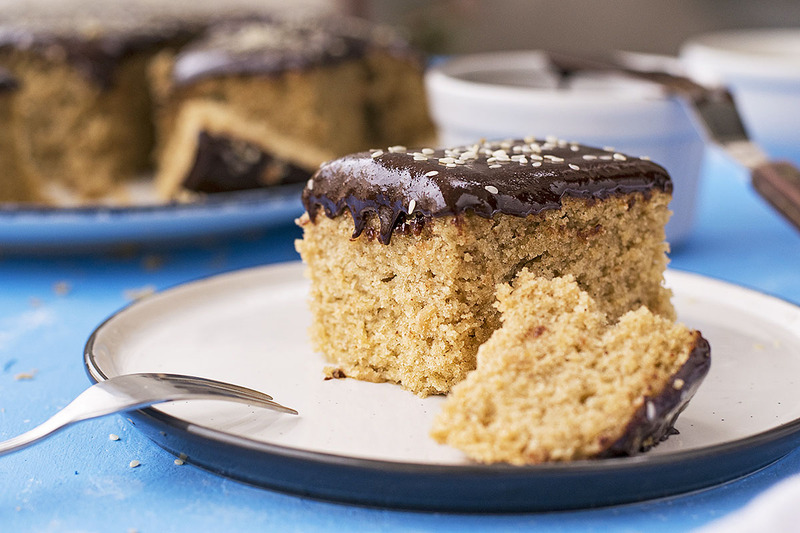 This vegan olive oil cake may be delicious on its own but it pairs AMAZINGLY with the tahini chocolate ganache. 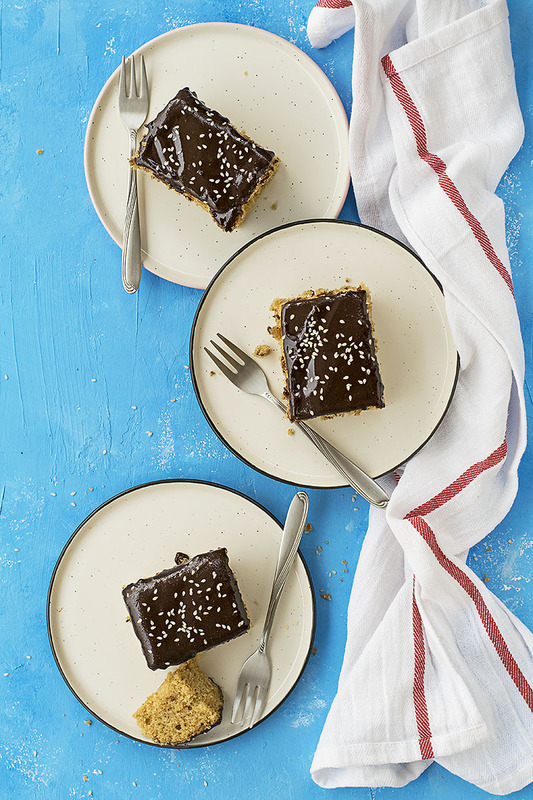 The flavors of the cinnamon, cloves, and orange zest are complemented perfectly by the chocolate flavor and the nutty tones of the tahini ganache resulting in a cake everyone will remember! I’ve made a tahini chocolate ganache before for this olive oil and banana blender cake, which as the name suggests can be made in a blender or in a food processor. That ganache was made mainly with chocolate and tahini, but I wanted to experiment a little further and knowing that tahini actually thickens when mixed with water, I decided to mix those two in a try to make an equivalent of heavy cream. This way I also managed to cut down on the calories! 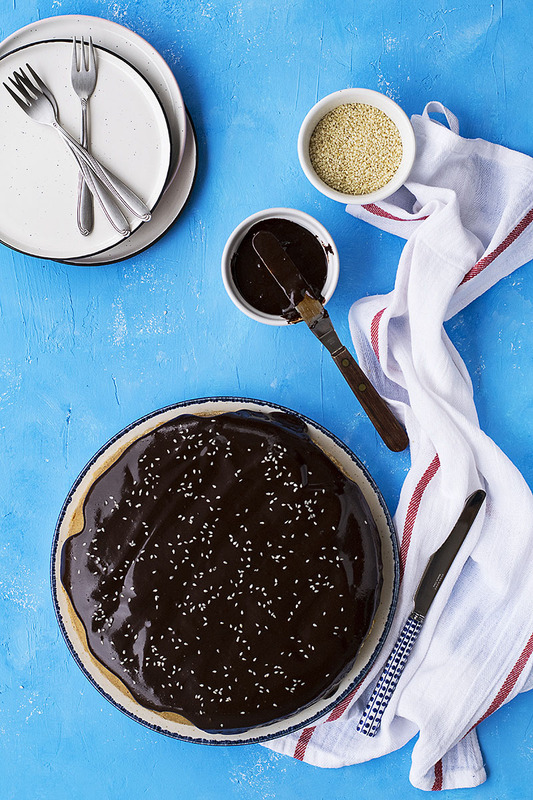 This cake is great even without the ganache, so you can also make it plain. Test doneness with a skewer inserted in the middle of the cake. It should come out clean, free of crumbs. Fanouropita is usually cut into squares and is shared with friends and neighbors. For the best flavor use half e.v. olive oil and half another neutral tasting oil. This cake can be stored at room temperature for up to 3-4 days and refrigerated for up to a week (let it come to room temperature before serving). Preheat your oven to 350°F (175°C) and oil and flour (or line with baking paper) a 10-inch baking pan. Make the cake: Transfer the sugar, the cinnamon, the cloves, and the salt to a bowl and stir to combine. Add the vanilla, the oil, the orange juice, the zest, and the baking soda and whisk until the sugar is dissolved. In a separate bowl, mix the flour with the baking powder and add them to the liquid mixture. Stir until the mixture is smooth and pour the cake batter into the pan. Bake for approximately 35-40 minutes or until a skewer inserted in the middle of the cake comes out clean. Let it cool in the pan for 10 minutes and invert onto a rack to cool completely. Make the tahini chocolate ganache: Transfer the tahini, the maple syrup, the sugar, the salt, and the cinnamon to a small pot. Add the water gradually and stir until the mixture is homogenized. Heat over medium heat until steamy, remove from heat and add the chopped chocolate. Let it rest for 1 minute and stir until the chocolate is melted. Let it cool. 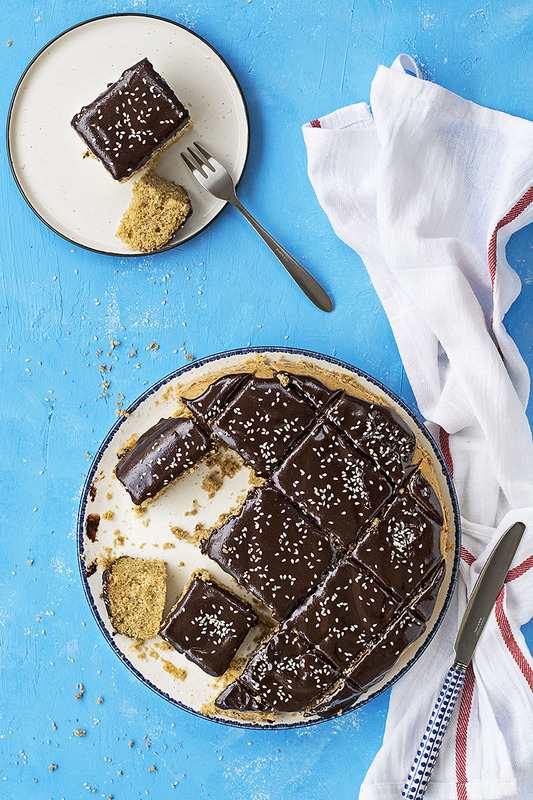 Spread the tahini ganache over the cooled cake and sprinkle with sesame seeds. OMG! This looks so good! I seriously need to head to the supermarket for a shopping now. 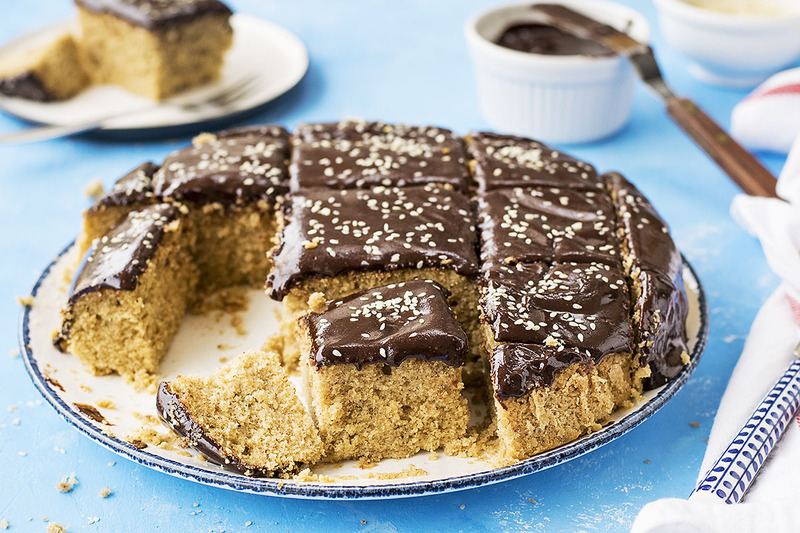 This looks simply AMAZING…That Tahini Ganache on top looks divine.